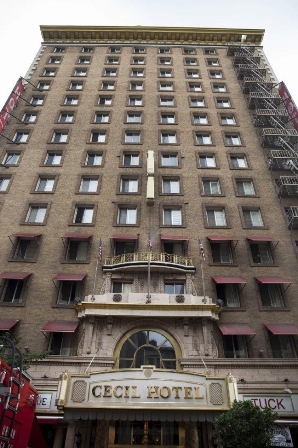 A Los Angeles City Council committee examined a proposed ordinance Wednesday that would aid the transition of some of the city's hotels or motels into temporary or supportive housing for the homeless. According to a report from the City Planning Department, there are approximately 10,259 guest rooms in at least 382 motels in the city of Los Angeles, and some could be converted to temporary or supportive housing for the homeless at a low cost. Motels would be the most likely to take advantage of the program, the report said. The proposed ordinance under consideration by the Homelessness and Poverty Committee would ease some of the zoning requirements and other regulations that apply to a motel that wants to convert to supportive or temporary housing, with the requirement that all the units be affordable with at least half of them available for homeless people. Measure H, a county-wide measure adopted in March 2017, has expanded the availability of funding to provide rental assistance and supportive services to residents who require transitional housing, which could help facilitate the use of hotels and motels on an interim basis, the Planning Department report said. Owners of any participating property would be required to provide evidence demonstrating that supportive services for the residents will be provided, and the applicant will be required to show that a local public agency, such as the L.A. County Department of Mental Health Services, has issued a commitment to fund those services. The proposal is the latest in a series of initiatives taken up by the City Council to address the problem of spiking homelessness in the city, which jumped by 20 percent in 2017 to 34,189, according to the results of the 2017 Greater Los Angeles Homeless Count. On Tuesday, City Councilman Jose Huizar proposed that the city house about five dozen homeless people in trailers on a downtown lot as a possible model for citywide temporary shelters.